High Construction today announced that it received a $21M contract for Elizabethtown College’s new Bowers Center for Sports, Fitness and Well-being. The new facility will be located on the college’s campus, off East Cedar Street in Elizabethtown, Pa.
“After several months of collaboration with the college, CannonDesign, and other project team members during the preconstruction phase, we’re thrilled to officially put our shovels in the ground and transform the team’s hard work and exciting vision into reality,” says Richard (Rick) L. Stoudt, Jr., president of High Construction. 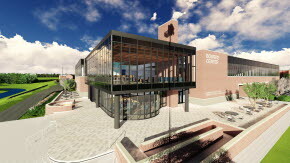 Spanning 81,900 square feet, the new center will encourage the well-being of students with an array of fitness and wellness spaces, including a field house with tennis courts; a basketball court; an indoor track; areas for yoga, weight training, and group fitness; locker rooms; a cafe and lounge; and a demonstration kitchen, among other amenities. A ceremonial groundbreaking for the project was held on February 2. Earthwork started yesterday, and the facility is scheduled to be completed summer 2019.